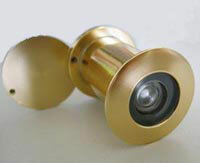  Specialty Viewers and Peepholes for all Security Applications.  Ideal for the Elderly, Mobility, and Visually Impaired Individuals.  See Who is Knocking from Up to Seven Feet Away. Conventional peepholes only give you a very limited view of who is outside your door. A solid door is your first and last barrier to protect yourself and your family from potentially harmful situations. Your best and wisest investment today is a quality Wide Angle Projection Door Viewer. PEEPHOLE.CA supplies innovative door viewers not found on your average hardware store. They can greatly improve your home security against home invasion or strangers knocking outside your door. These small high-tech security devices provide a large panoramic view of who is on your front door from up to seven feet away, without having to press your eye up to the door in dangerous situations. Want to be a Dealer/Contractor? NEW PRODUCT INTRODUCTION - AVAILABLE NOW! The WideScope EX is one of the few large diameter peepholes to meet the strict requirements of commercial and industrial installations. This heavy duty solid brass unit is designed for durability and accuracy. It integrates high definition glass condensing lenses that capture light sources in any dark environment. The optical lenses are almost 1.0” in diameter, fireproof, and scratch resistant, providing a sharp 200º wide angle view under any lighting conditions. Requires a 1 1/8" opening. The WideScope is designed for door thickness 1 3/4” to 2 1/8” and may be expanded up to 3 .0” with the optional extension cylinder in ½” increments. It includes a privacy cover plate for total privacy and security against surveillance devices. Available in brushed silver finish only. This unit is UL fire rated (US and Canada ) suitable for commercial and industrial installations. This Heavy Duty Privacy Cover design is similar to the built-in privacy cover of the EZView series door viewers. Specifically designed for most peepholes with a cylinder diameter of 9/16" (14mm) for added security and privacy. This is an economical way to upgrade existing installations without the added expense of purchasing a new peephole with privacy cover. Most suitable for hotels and motels that require a large quantity of privacy covers for their rooms with standard 14mm peepholes already installed. This Privacy Cover is made of solid 2.5 mm thick brass for durability and fire resistance. The overall diameter of the cover is 1 3/16" (30mm). Available in polished brass and chrome finish. Comes in a package of two units. The latest in Advanced Glass Lens system with unique prism technology that provides a projected image onto a 2.25” screen. See the large image from up to seven feet away without effort. For doors from 1" to 1 ¾” in thickness. Body made of impact resistant ABS plastic resin. Requires a 2 3/8" opening. This is a "projection" type viewer and needs good lighting for optimum viewing. Identical advanced lens system as the UltraVision, but in a smaller footprint. Image projected onto a 2.0” screen. The unique prism technology assures a one-way view for total privacy. For doors from 1” to 1 ¾” in thickness. Body made of impact resistant ABS plastic resin. Requires a 1 3/4" opening. Identical advance lens system as the UltraVision but in a more compact and low profile size for discreet installations. Image is projected onto a 1.5” screen. Identify visitors from six feet away. For doors from 1" to 1 ½” in thickness. Body made of impact resistant ABS plastic resin. Requires a 1 1/2" opening. Unique miniature size 200º peephole designed for thin doors from 3/4” to 1 3/8” thickness. Advanced glass lens provides exceptionally sharp and clear view superior to most conventional peepholes. Unit includes a privacy cover plate for total privacy against “reverse peephole” surveillance devices. Made of solid polished brass. Requires a 9/16" opening. Available in brass,chrome, and antique. UL fire rated (US and Canada) suitable for commercial and residential installations. The MIcroScope is the smallest & shortest peephole in the market. Specially designed for thin door panels from 1/2" to 3/4". It offers a remarkably sharper and clearer 180º view beyond any conventional peephole. Easy to install with a 1/2" drill bit. Made of solid brass. Available only in gold finish. NEW ITEM - AVAILABLE NOW! Sophisticated optical device required for thicker or reinforced doors from 1 3/8” to 2 1/4” thickness. Option to extend length to 3.5" available. Exceptionally sharp and clear 200º image reproduction better than conventional peepholes. Requires a 9/16" opening. Unit includes a privacy cover plate for total security and privacy. Made of solid polished brass. UL fire rated (US and Canada) for commercial and residential applications. The EZView-ST is the TOP-OF-THE-LINE EZView series of high tech security devices that virtually eliminate the traditional peephole. It has a wide angle direct-view optical glass lens system that provides a sharp 200º extra clear image of the outside under all lighting conditions. With a viewing area of almost 1” diameter, the EZView-ST is a heavy duty commercial grade viewer that allows observation as close as a few inches to as far as three feet away from the viewer with no distortion. Body parts made of Carbon Steel for extreme durability and lasting looks. Requires a 1 1/16" opening. It includes a build-in privacy cover plate for total privacy and security against surveillance devices. Designed for door thickness 1 1/2" - 2 3/8" . Ideal for the visually impaired, seniors, and handicapped individuals. Available in high grade polished chrome finish only. Did not find the viewer or peephole you need? Click here for more choices. Shipping charges only applicable for USA and Canada.